After a wound to the skin has occurred, both skin cells and connective tissue cells (fibroblasts) begin multiplying to repair the damage; this creates a scar, made up of fibrous “connective tissue” that the body creates to hold the wound closed. Keloids are raised, reddish nodules that develop at the spot where the wound is healing. When the fibroblasts continue to multiply even after the wound is filled in, keloids form above the surface of the skin and form large mounds of scar tissue. The upper back, shoulders and upper chest are especially prone to keloid formation. Symptoms of keloids include pigmentation of the skin, itchiness, redness, unusual sensations and pain. Most people never form keloids, but some people are prone to them and get them even after minor injuries, acne or insect bites. Similar to a keloid are hypertrophic scars, which are more common. They tend not to get as large as keloids and may fade with time. They occur in all racial groups, as do keloids, although they are more common in people with dark pigmentation. Keloids are considered a benign tumor and not dangerous. 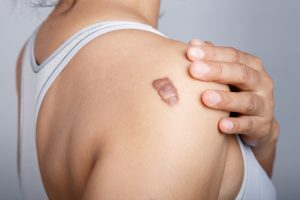 Surgical solutions for keloids may cause new scar tissue to form; therefore many people have been told they are not treatable. Our office does have ways to successfully treat keloids. Treatments vary from case to case, but may include laser, cryosurgery (freezing), excision and steroid injections.